Yee-haw!! Howdy from Disney’s Wilderness Lodge! 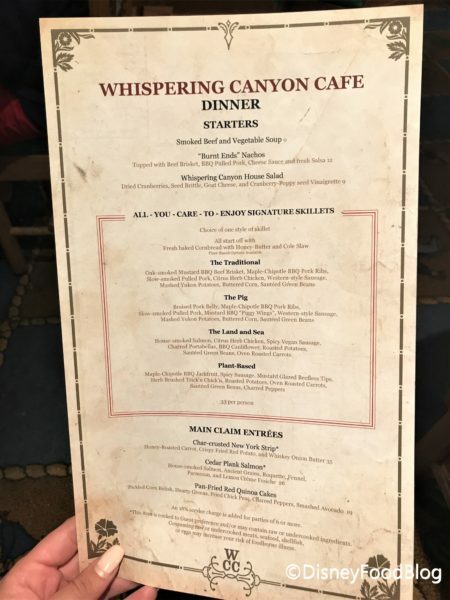 We decided to mosey on over to Whispering Canyon Cafe, because they changed their dinner menu earlier this week. Whispering Canyon Cafe has long been a favorite spot for comfort food, all-you-can-eat skillets, and rowdy antics from the servers, and we were excited to see what new eats they had to offer! Located off the gorgeous main lobby at the Wilderness Lodge, Whispering Canyon Cafe is a table service location full of delicious eats and lots of fun. Be prepared for the stick-pony races, silly antics from your servers (yep, they’re still in full swing), and an old fashioned good time! 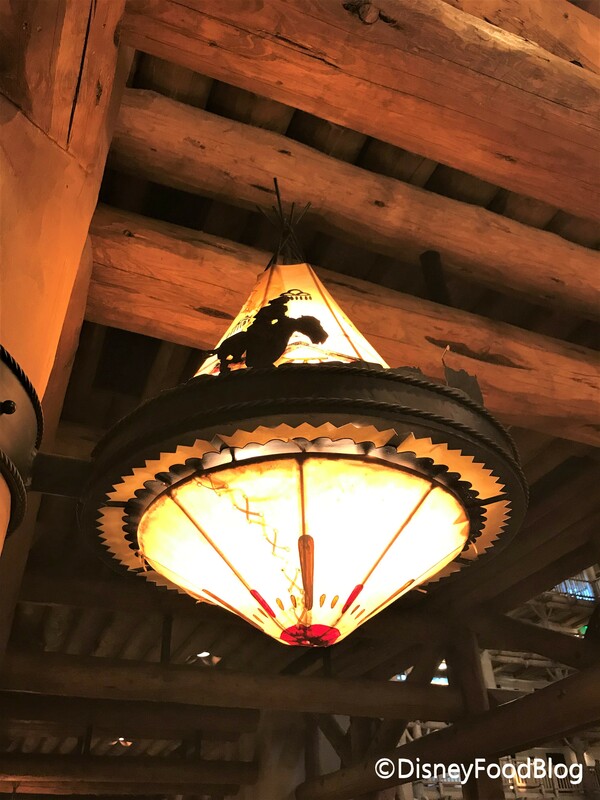 From the painted chair backs to the awesome light fixtures, the decor really sets the mood for Wild West fun. 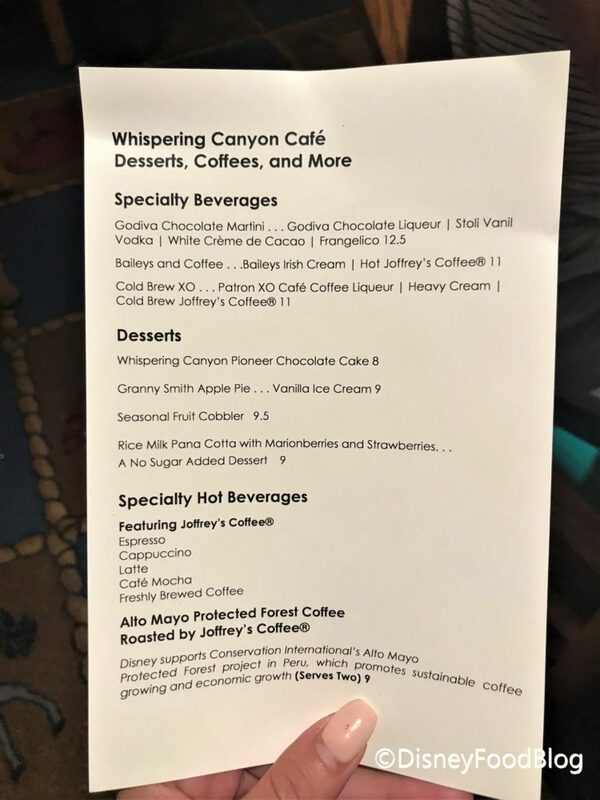 If you’ve been to Whispering Canyon Cafe, this may be no secret to you. But for those who haven’t visited, you will definitely want to ask for some ketchup (like, whether you need it or not). We don’t want to share exactly what happens next so it can be a surprise, but we will say that the result is a lot of fun and any little cowpokes in your group will get a real kick out of it. 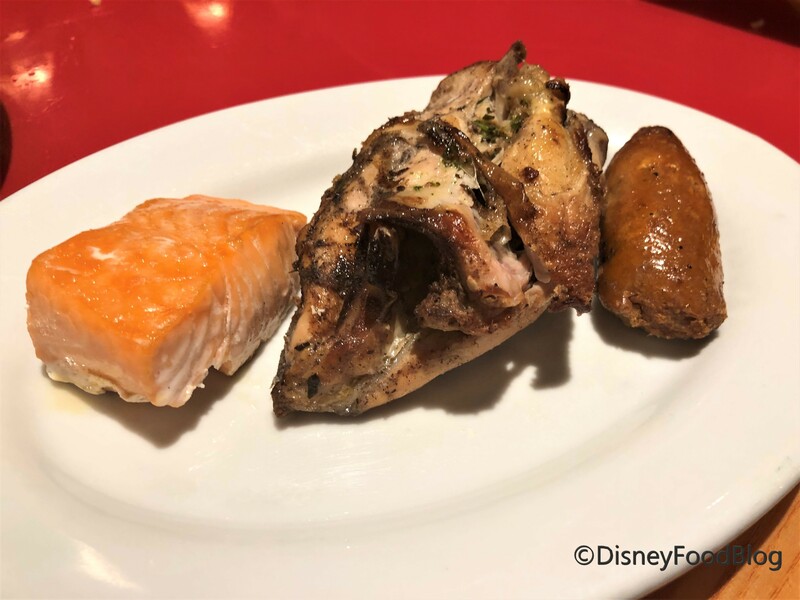 We’re keeping the tour short, though, because as I mentioned, the reason for this particular visit was to try out the new dinner menu! The biggest addition is that they have THREE new all-you-care-to-enjoy skillets! 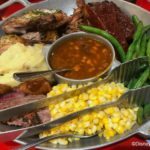 The Traditional Skillet has been a staple at Whispering Canyon Cafe, and now they have expanded their skillet offerings with a few variations. 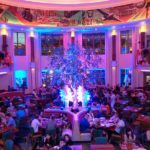 The flip side of that change is they have greatly reduced the number of a la carte entrees and appetizers. 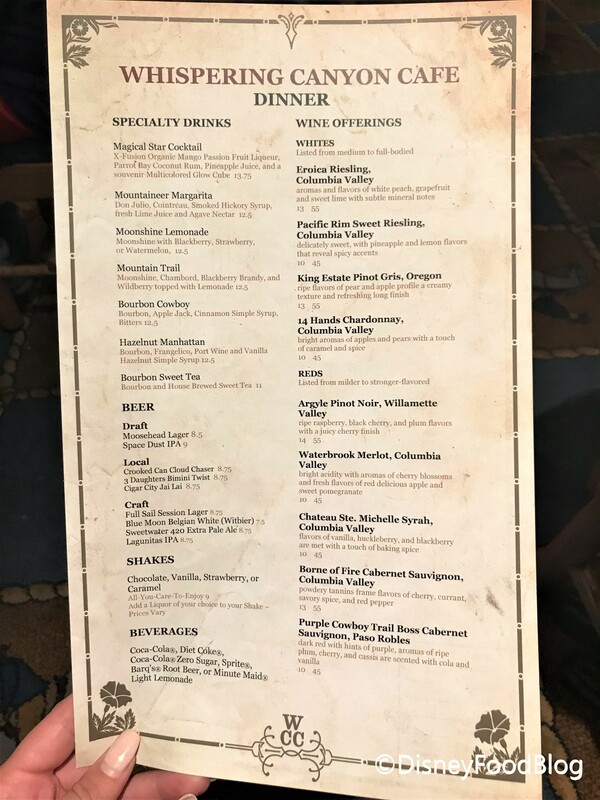 But they also shook up their specialty drinks selection! Everything besides the Magical Star Cocktail (which is a staple around Disney World lounges), is either a new addition or the recipe has been updated. 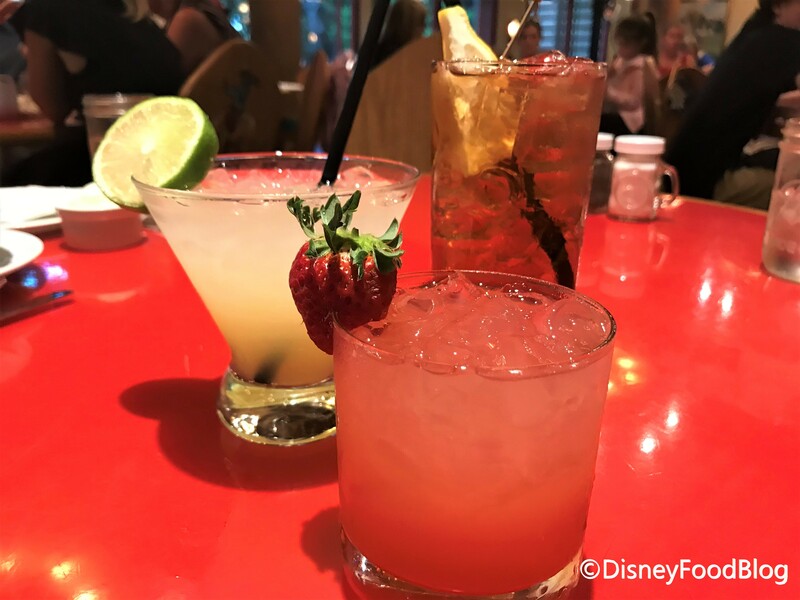 We decided to try two brand new drinks — Bourbon Sweet Tea and the Mountaineer Margarita — and one revamped classic, the Moonshine Lemonade. The Bourbon Sweet Tea is just two simple ingredients. You guessed it: Maker’s Mark Bourbon and sweet tea. This was a great drink — albeit pretty strong, so heads up! If you are a big bourbon fan, adding the sweet tea is a unique twist that fits nicely with the Whispering Canyon vibe. 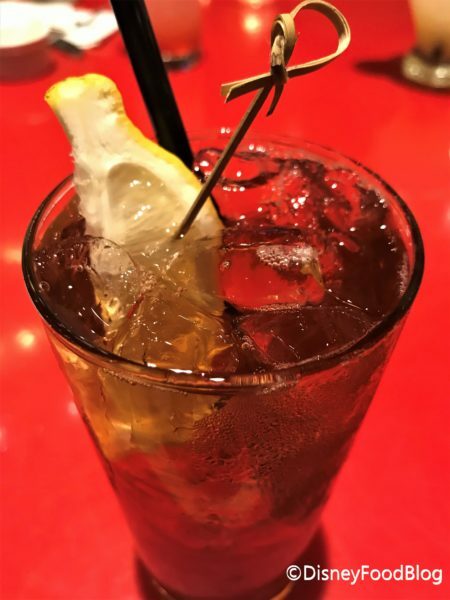 It’s a fun and simple cocktail that I’d certainly try again. Next up, the Moonshine Lemonade! 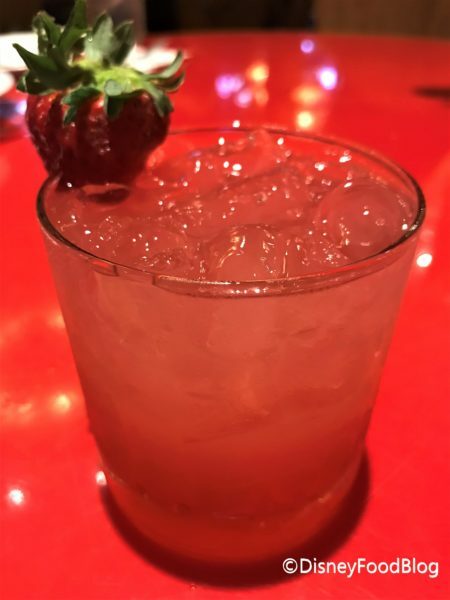 The Moonshine Lemonade comes with your choice of flavored lemonade — strawberry, blackberry, or watermelon. We went with Strawberry. Last up, the Mountaineer Margarita. 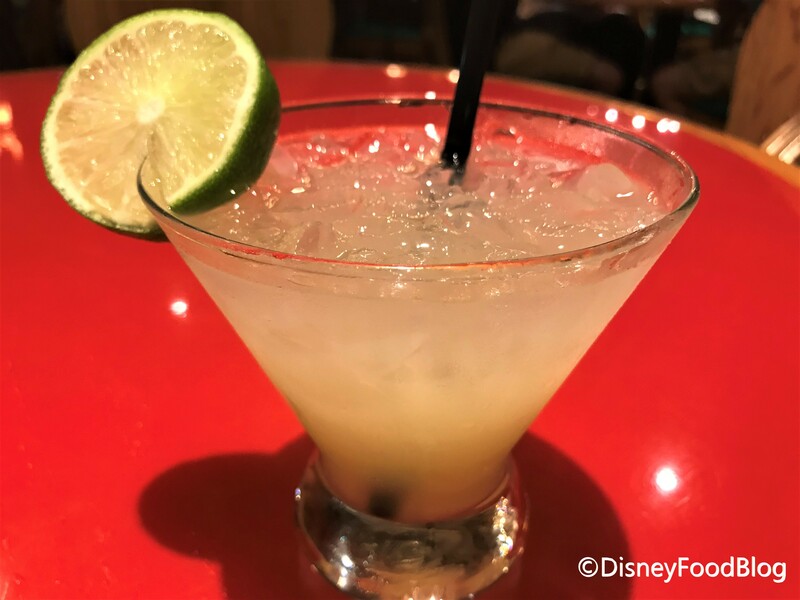 This is a classic margarita made with Don Julio Tequila, Cointreau, fresh Lime Juice and Agave Nectar, but it has a cowboy twist — Smoked Hickory Syrup! This drink was fantastic and ended up being the favorite of the night. It was a good margarita to begin with, but the smokey syrup really shines through and takes it to the next level. Highly recommend this one! Now for the eats! The first thing we tried was the new Smoked Beef and Vegetable Soup. 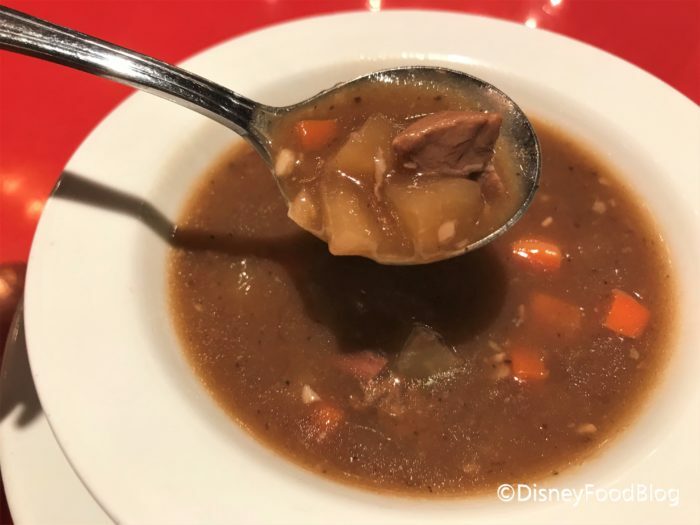 This hearty soup was really more of a stew, full of smoked beef chunks, potatoes, onions, and carrots. 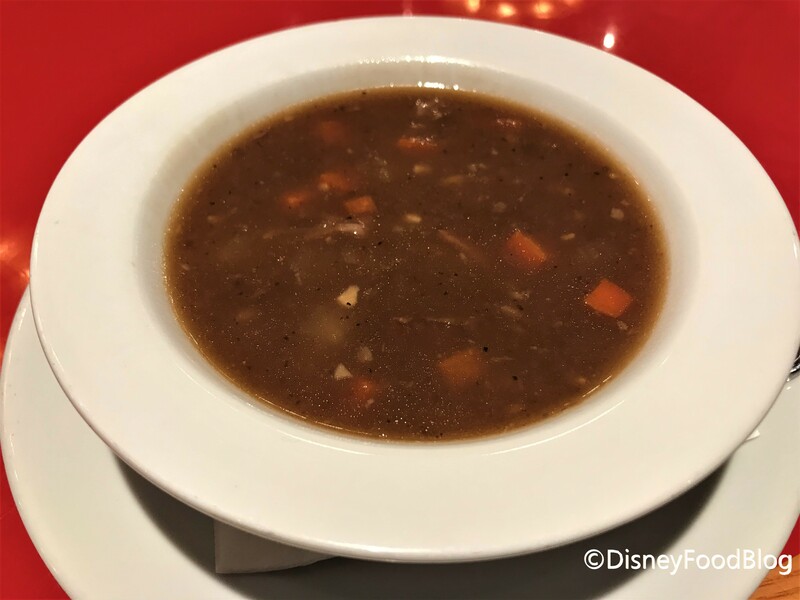 This was certainly a good stick-to-your-ribs soup that you’d expect from Whispering Canyon. The beef was plentiful, and the potatoes were nice and soft. This relatively simple dish was comfort food at its finest, and paired with a salad this would make a great meal on its own! Next up, we HAD to try out these new skillets! From left to right, you’ll see The Land and Sea, The Pig, and The Plant-Based. Don’t forget that all of these skillets (and the Traditional) are all-you-care-to-enjoy so come hungry! When you order any of the skillets, the first thing to arrive is delicious fresh cornbread and honey butter! You can literally see the honey oozing throughout the butter. 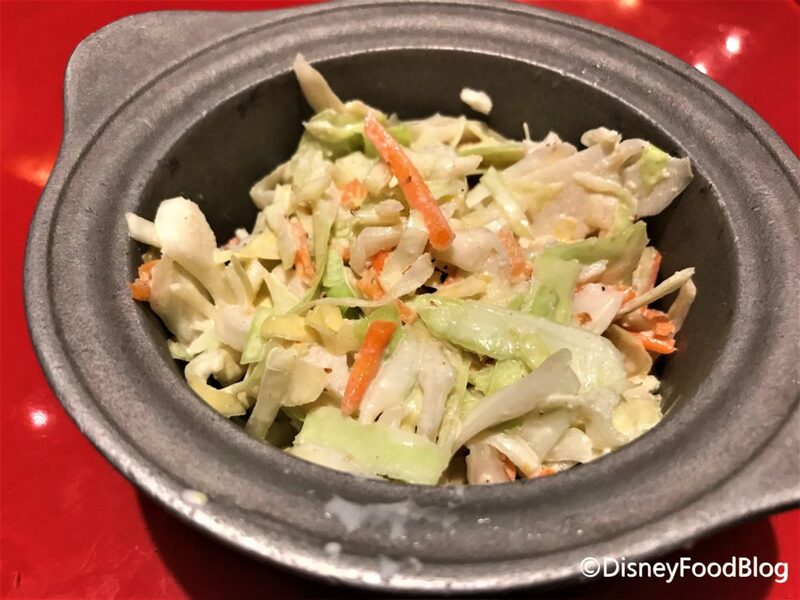 (As our awesome server, Mike, said “Do with it as you must.”) Also available upon request is coleslaw. The coleslaw is crisp and fresh, and not too overdressed, which happens easily with slaw. There is also a vegan slaw available if you’d prefer. Unlike its mayo-based cousin, the Vegan Coleslaw has a vinegar-based dressing. It’s not too overwhelming or acidic, and I actually preferred it over the regular slaw even though I am not vegan. That’s right, this isn’t just vegetarian, it’s completely vegan friendly! 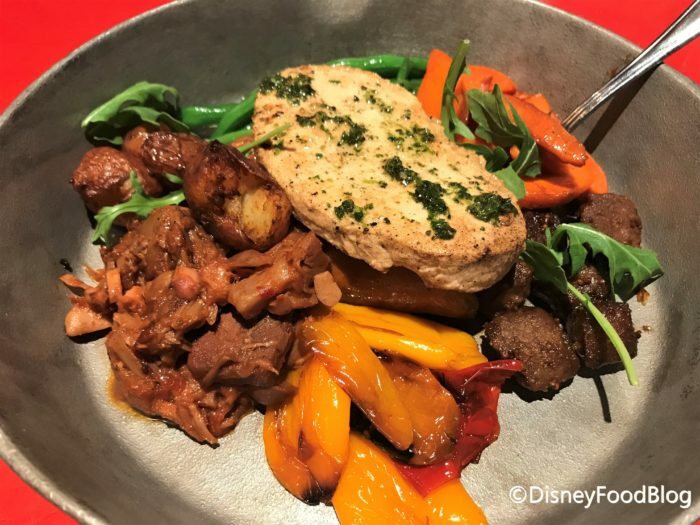 The Plant Based Skillet comes with Maple-Chipotle BBQ Jackfruit, Spicy “Sausage”, Mustard Glazed Beefless Tips, Herb Brushed Trick’n Chick’n, Oven Roasted Carrots, Sauteed Green Beans, and Charred Peppers. Out of all the proteins, the Chick’n was my favorite. The moho sauce was delicious — I would gladly put that on just about any meat (or “not meat”!) The beefless tips were also seasoned nicely and the sauce was delightful. 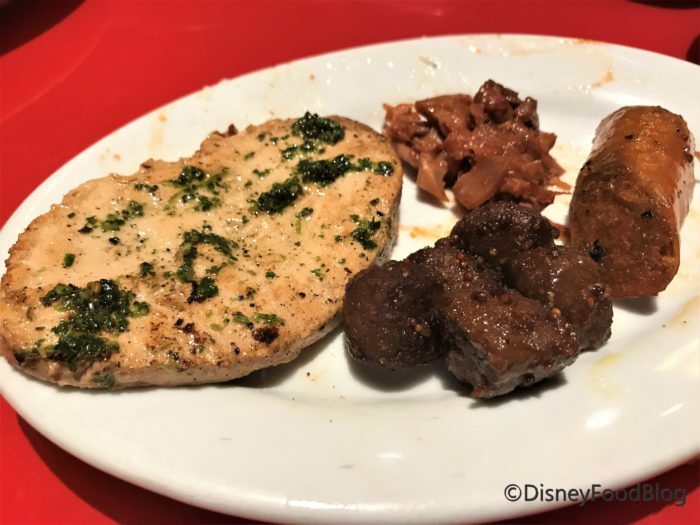 The sausage is full of flavor as well, with strong hints of coriander and garlic. Lastly, the jackfruit! This is a common vegan substitution for pulled pork, and was an especially nice addition to the skillet because it gave it the western flavors you expect at Whispering Canyon. 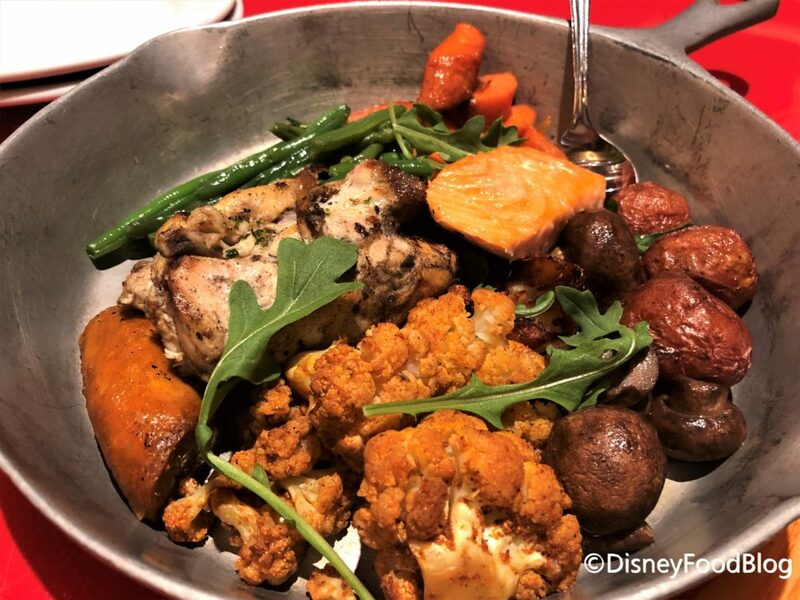 The team at Whispering Canyon even made sure the vegetables would be completely vegan-friendly by steaming them or roasting them in oils instead of butter. The green beans and carrots were good, if nothing special, but the peppers were amazing! Nice and charred with a little kick! Overall, this isn’t something that I would necessarily order again or recommend to someone that isn’t vegan. Meat substitutes certainly have an acquired taste and texture. That said, if you are vegan (or vegetarian), this is an awesome option for you! 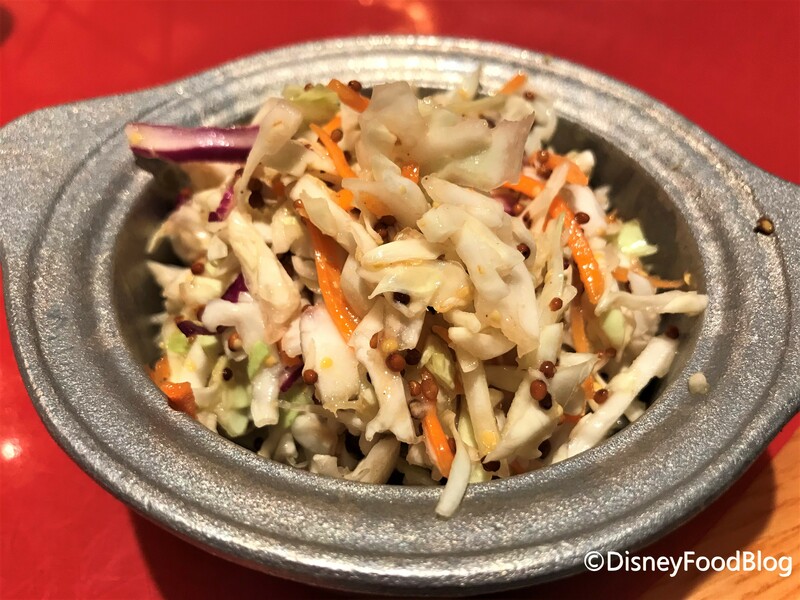 It’s one of the most unique vegan offerings we’ve seen around Walt Disney World… and at a restaurant where you’d least expect it, no less. Next up, the Land and Sea Skillet. This skillet comes with House-Smoked Salmon, Citrus Herb Chicken, Spicy Vegan Sausage, Charred Portabella Mushrooms, BBQ Cauliflower, Roasted Potatoes, Sauteed Green Beans, and Oven-Roasted Carrots. The House-Smoked Salmon was the favorite from our table! It had a perfectly crisp skin, and a bright, fresh flavor. The Herb Chicken was also a big hit thanks to its perfectly roasted skin, as was the BBQ cauliflower for spicing up an otherwise ordinary vegetable. The sausage is the same offered on the Plant-based Skillet, and the Portabellas were perfectly cooked! If you are a mushroom fan, you are seriously going to love these buttery ‘shrooms. The green beans, carrots, and potatoes were all delicious and perfectly cooked as well. Nothing too exciting, but they certainly taste fresh and add a nice light addition to all of the meats. 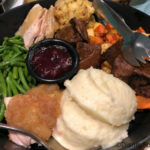 Overall, the Land and Sea is a great healthier option for those who want to enjoy the rowdy atmosphere at Whispering Canyon, but want something a little lighter. Last up: The Pig Skillet. 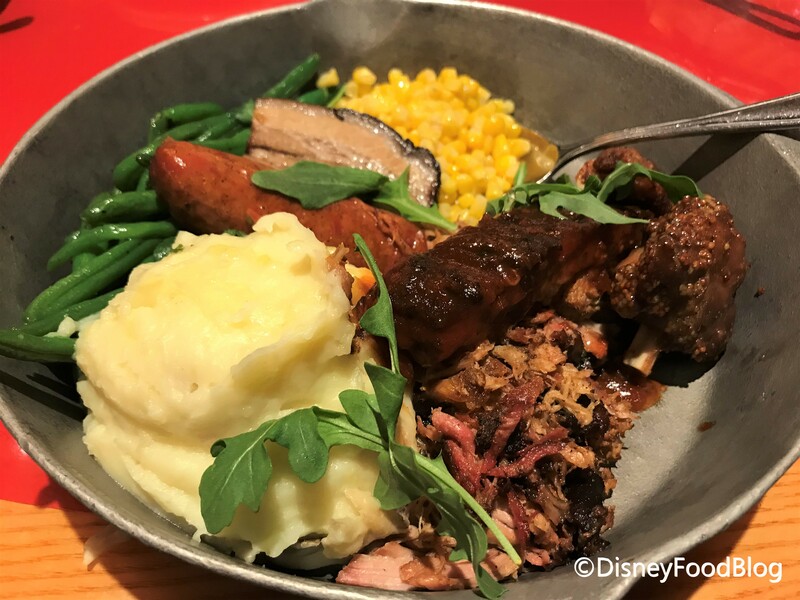 This skillet comes with Braised Pork Belly, Maple-Chipotle BBQ Pork Ribs, Slow-smoked Pulled Pork, Mustard BBQ “Piggy Wings,” and Western-style Sausage and is accompanied by Mashed Yukon Potatoes, Buttered Corn, and Sauteed Green Beans. The Pig is the closest to the Traditional Skillet and the kind of eats you think of when you come to Whispering Canyon Cafe. The Ribs were our favorite, as the sauce is terrific and the meat literally falls off the bone. 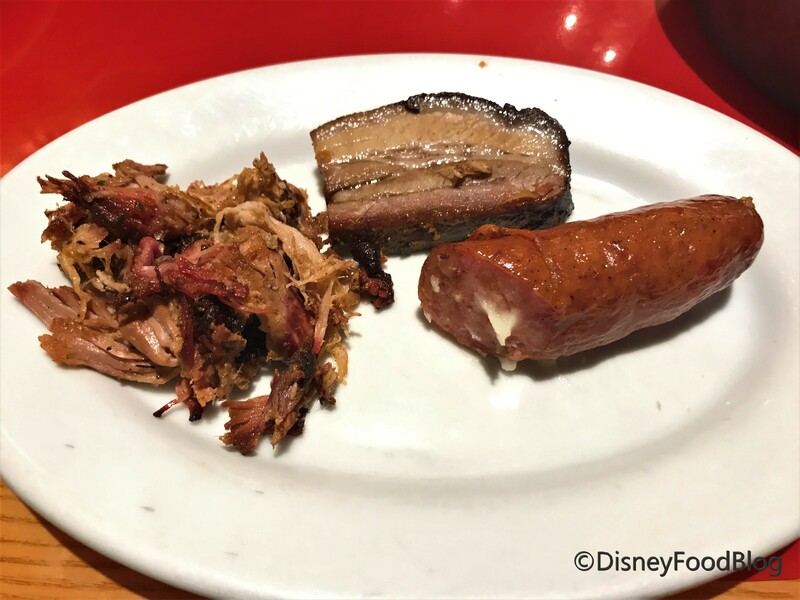 The Pork Belly was some of the best I’ve had at Disney, and getting it in the skillet is a great way for less-adventurous eaters to try it. The Pulled Pork has a nice smokey flavor, and we highly recommend getting a bite of it with the deliciously buttery mashed potatoes. The “piggy wings” were actually my least favorite on the plate, as they were a little under-sauced for my taste. The sausage, green beans, and corn were all good, but again, nothing too exciting. Overall, this was the favorite skillet of the night, and we absolutely asked for more ribs. 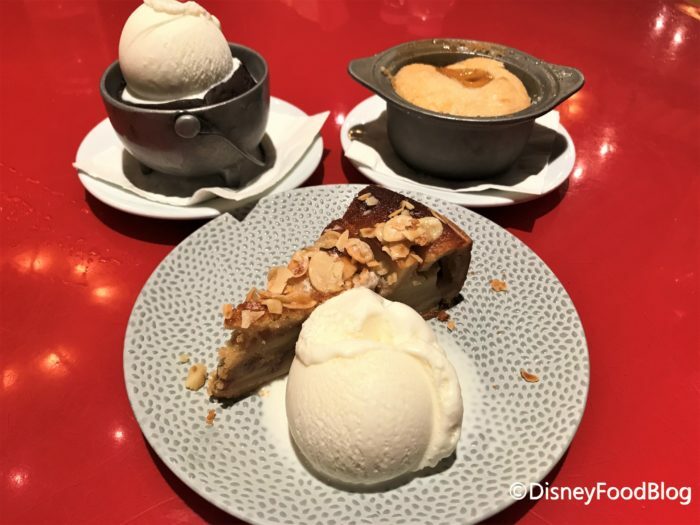 Even though we were stuffed, we couldn’t resist trying their new desserts! Our server let us know that once again, most desserts on the menu are new or have been updated. 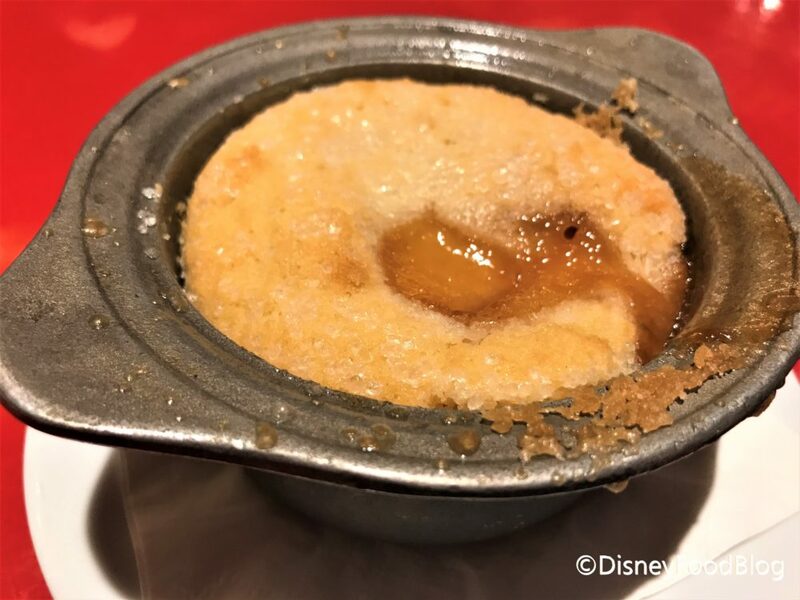 We decided to try the Whispering Canyon Pioneer Chocolate Cake, Granny Smith Apple Pie, and Seasonal Cobbler. First up, the Chocolate Cake. They recently went to a flour-less recipe instead of a traditional chocolate cake, and it comes served a la mode. 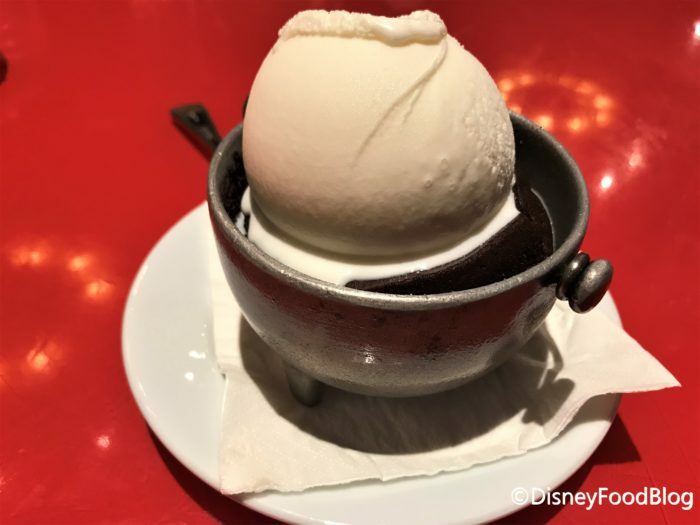 This was more like a lava cake, and the warm, gooey cake is a perfect bite with the vanilla ice cream. 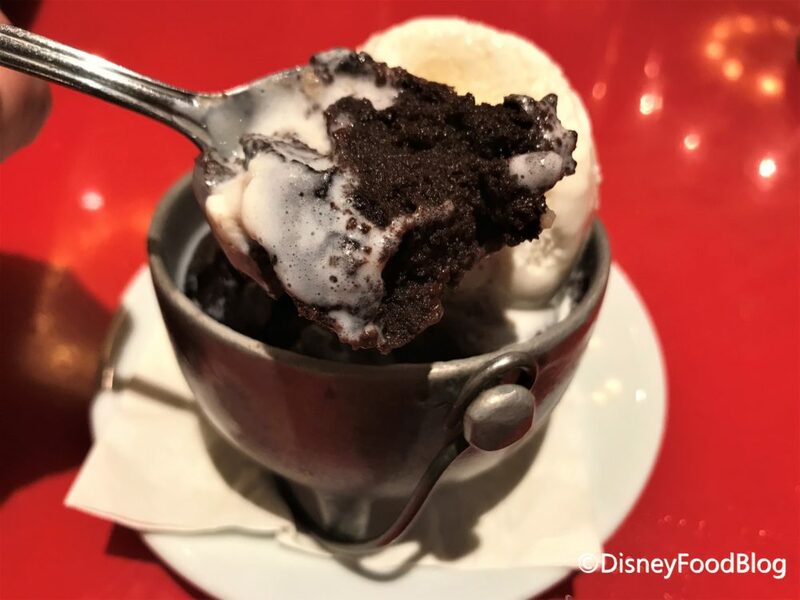 This dessert is very rich, especially after the big meal you just had, so we recommend sharing! Next up, the Granny-Smith Apple Pie! This is also served with vanilla ice cream. 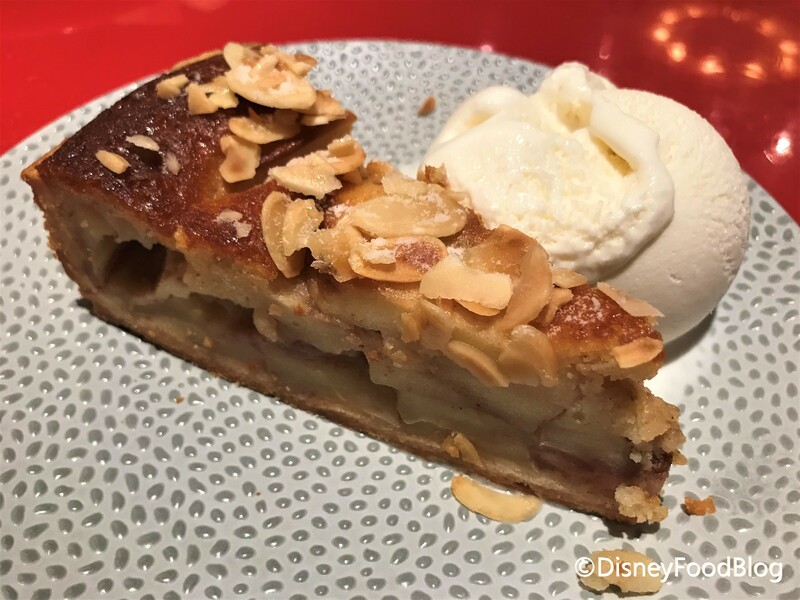 The pie is topped with slivered almonds, and comes in a crisp and crumbly crust. There are big chunks of fresh Granny-smith apples, which give the pie a tart flavor. It matches perfectly with the ice cream, and even though we were stuffed, we licked this plate clean! Last but not least, the Seasonal Cobbler which was Peach for us. Some of you may remember the seasonal cobbler being a very popular dessert at Artist Point, before it was transformed into Storybook Dining with Snow White. While we love the new character dining experience, we were sad to see this go — so we are SO happy it’s back at the Lodge! The crust is crumbly and sweet, but not too sugary. Most of the sweetness from the tart comes from the fresh peaches. This was absolutely my favorite dessert, and possibly my favorite thing I ate all night! 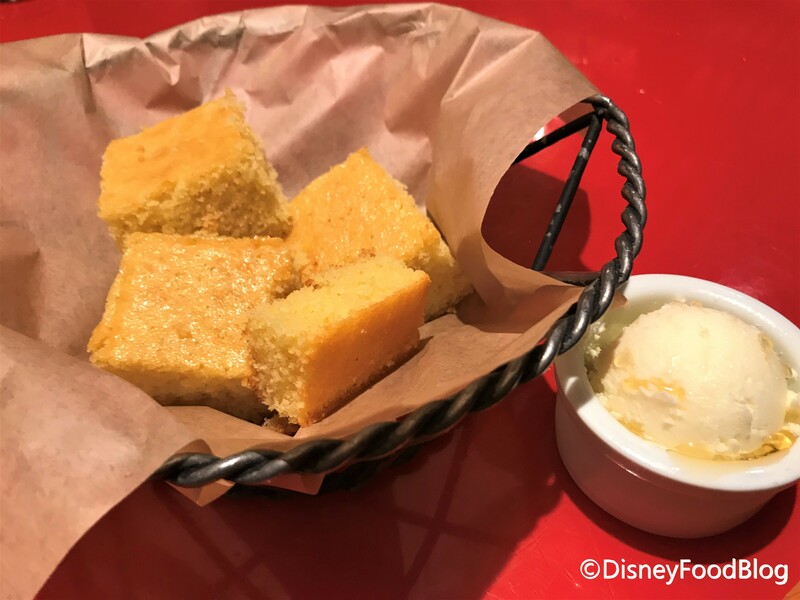 Overall, Whispering Canyon Cafe’s new offerings were pleasant surprises! It’s nice that they have expanded the menu to accommodate people who would prefer a lighter or vegan meal. We never thought we’d recommend Whispering Canyon as one of the top vegan meals on property, but here we are! All three drinks we tried were unique and fitting to the location, as were all of the desserts (especially the cobbler!!). 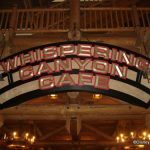 Whispering Canyon Cafe still lands as a great dinner spot, especially with kids, thanks to the rowdy antics, and reliable comfort food. 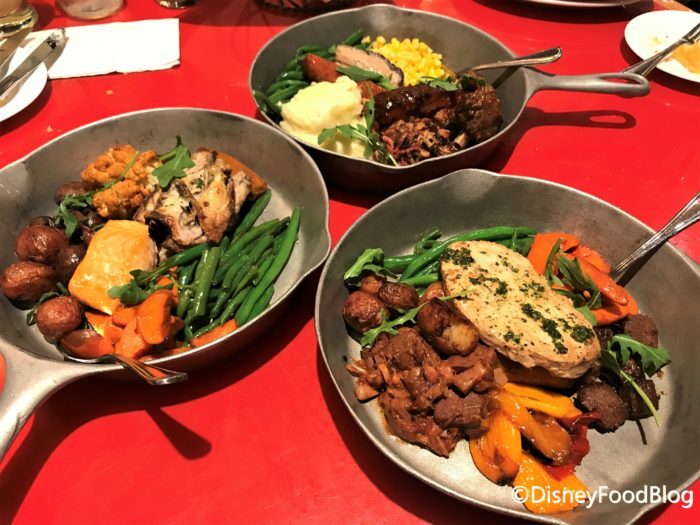 We will certainly be back… and, don’t forget that starting March 26th, some new Skillets will be joining the breakfast menu at Whispering Canyon Cafe, too! 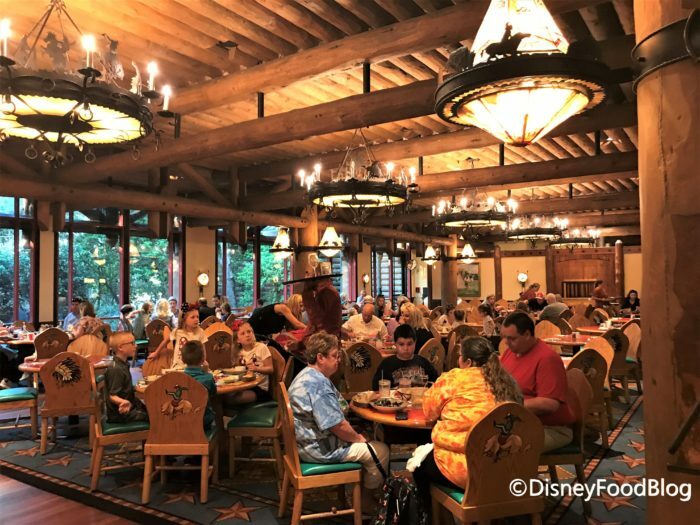 For a full tour of all the dining options at Disney’s Wilderness Lodge, check out our video below! 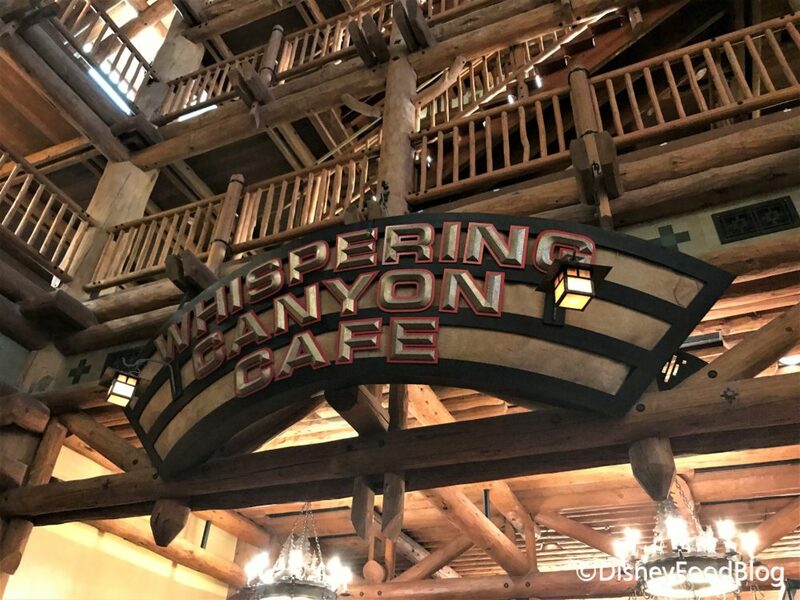 What do you think of Whispering Canyon Cafe? Will you stop by on your next vacation? Let us know in the comments! 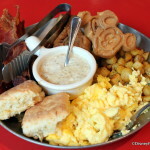 Don’t Forget to Order Ketchup at Whispering Canyon Cafe Breakfast in Disney World! « What’s New at All Star Music Resort: New Cupcakes Debut, Old Favorites Return and MORE!! Were the stick pony races really back? Last visit there, they had been discontinued. Great info! What are piggy wings? Yley, a piggy wing is a trimmed portion of the ham shank.